While I am not a big fan of romance novels there are some authors on my ‘auto read’ list no matter the genre. Francine Rivers is one such author, her Mark of the Lion Series is an all time favourite. Some of her other books that I’ve read many years ago (The Scarlet Thread, The Atonement Child and Redeeming Love) are ones that have never left me. There are some books that work great in audio format and others not so much. The Masterpiece works great in audio, with 2 different readers (one male, one female - because who wants to listen to a female reading a male role?). It’s not a short book coming in at 15 plus hours so there was plenty of time for the author to develop the characters, get to know them and learn what makes them tick. I loved the story, realistic and raw, heartbreaking and a true picture of those hurting. Both Roman and Grace have ghosts that haunt and secrets they keep to themselves. The Masterpiece is a story of unfailing love, redemption, and healing. Mesmerizing in its telling that I’m not even sure it would have had the same impact if I read the book verse listening to the audio. 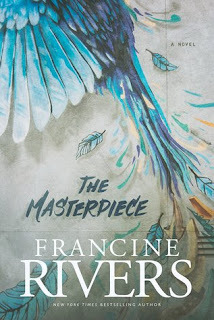 Francine Rivers is an author I have great respect for. She crosses genres effortlessly, from historical fiction, to contemporary, dual time periods and romance without skipping a beat. Yes her books are faith based, and she doesn't hold back but tells it like it is. Audiobook obtained via Scribd (and yea one day this book with grace my bookshelves with my other Francine River books).